Interactive Diagnostic and Presentation Tool (IDP) to display climate model results by way of maps and diagrams. This tools allows to conduct explorative data analyses and visualize their results. Climate variables and their developments can be displayed as graphs or maps (see examples on the right-hand side). IDP provides a multitude of figure types and display style options. Those are conforming to established good practices of climate model result visualizations. Numerous WMO-endorsed climate indicators can be produced and display with IDP. Furthermore, there ist he option of analyzing model ensembles. In addition, data can be exported for use in other models. 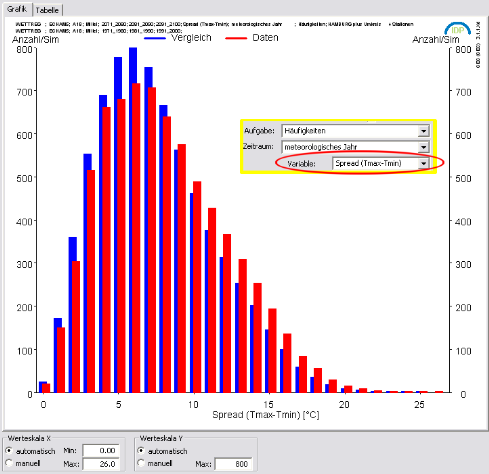 Example 1 for a diagram produced by IDP: Frequency distribution of daily temperatur spread at station Hamburg. Comparison between the periods 1971—2000 (blue) and 2071—2100 (red). Regionalization was carried out using WETTREG 2010, driven by the global climate model ECHAM 5, run 1, present time: 20C data, future: scenario A1B. Example 2 for a map display produced by IDP: Signal of the average daily maximum temperature in Germany. Comparison of the period 1971-2000 with 2071—2100. Regionalization using the RCM REMO, driven by the GCM ECHAM 5, run 1, present time: 20C data, future: scenario A1B.